The United States Bureau of Engraving and Printing (BEP) is the largest producer of security documents in the nation. Although it is most widely known for the production of Federal Reserve notes, paper currency is only one of many printed materials that originate from its facilities in Washington, D.C., and Fort Worth, Texas. BEP is also responsible for printing postage stamps, identification cards, Treasury securities, and other sensitive documents. 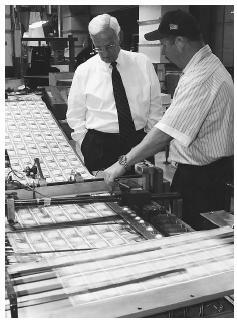 Former Treasury Secretary Paul O'Neil, left, looks at newly-printed bills with a Bureau of Printing employee during a tour of the Western Currency facility in Fort Worth, Texas. stamps, certificates recording obligations of the U.S. government, and a variety of other security documents authorized by various governmental departments. BEP became the sole authorized producer of U.S. paper currency in 1877, and in 1894 began producing postage stamps. By 1985, officials at the Treasury Department had become aware of the need for a BEP facility west of the Mississippi River, which would reduce the cost of transporting notes to Federal Reserve banks in San Francisco, Dallas, and Kansas City. Treasury therefore authorized BEP officials to accept proposals from potential host cities, for which there were 83 applications. In November 1986, BEP chose Fort Worth, and in 1987 began building what is today known as the Western Currency Facility. The design of the building, which in 1991 received an award from the local chapter of the American Institute of Architects, includes a glass pyramid intended to replicate the truncated pyramid on the reverse side of a one-dollar bill. Production. Today BEP continues to produce all paper money in the United States, while the United States Mint produces all coins. Both distribute their products solely through the Federal Reserve System, which in turn issues currency and coinage solely through member financial institutions. BEP is also responsible for the processing of claims for the redemption of mutilated currency. Its research and development department is concerned with anti-counterfeiting technology, which is perpetually upgraded in an effort to remain many steps ahead of counterfeiters. Although the production of U.S. currency is perhaps the most visible of BEP's activities, it is far from the only one. BEP produces a number of stamps and notes, including postage stamps for the United States Postal Service, license stamps such as those used on alcohol products, and Treasury securities. The lowest-value note ever issued by BEP was a $0.002, or one-fifth cent, wine stamp, while the item of highest value was a $100,000,000 International Monetary Fund special note. BEP has also manufactured currency for other nations, including pre-Communist Cuba. BEP produces federal identification cards, certificates of naturalization, and other security documents as requested by particular government agencies. Among its most specialized products are engraved White House invitations. History of the Bureau of Engraving and Printing, 1862–1962. Washington, D.C.: Treasury Department, 1964. The Money Factory. Washington, D.C.: Bureau of Engraving and Printing, 1993. Bureau of Engraving and Printing. < http://www.bep.treas.gov/ > (February 5, 2003).